This New Moon in Aquarius is giving us access to the collective powers of healing, moving on and expanding our worlds. Aquarius, the fixed air sign, wants us to expand our personal bubble of life and relocate into a bigger reality. In order for us to do this, we need to have faith in the “new” and do whatever it takes to prevent relapsing into the old. Every Quest begins with a Question. The chart of this New Moon in Aquarius coincides with the beginning of the Chinese New Year of the Earth Hog. Be sure to read more about my Earth Hog forecast and access the guided meditation to meet your very own Earth Hog animal totem who will be your guide throughout the Chinese New Year 2019. This chart has an astrological signature of Aquarius and there is a lot of fixed, mental energy flying around. This New Moon is all about our ability to heal from old wounds. We need to realize that most of us compensate, suppress and hide our wounds from the world, but this New Moon will make our wounds more visible to ourselves. This can be painful, or it can be healing, depending on how we respond to it. Sometimes the best way to heal is to move on. But in order to truly move on, we need to be resolved. Only then can we move from a place of perfection - meaning, we don’t run away, but accept the situation for what it is, and maturely, kindly and confidently, step forward and relocate into something new. The decan where this New Moon is occurring is the 2nd decan of Aquarius, which is ruled by Mercury and the Six of Wands. It also rules over the solar dates of February 5 to February 10 of every year, so for 5 days we will have a surge of electrifying energy, holding the energy of this New Moon. In other words, this is very auspicious as it serves for anything groundbreaking to be revealed! Mercury, the co-ruler of this lunation, will also be conjunct the New Moon giving more power to our intentions, fusing the mental with the inner, emotional world. We can truly embark into new worlds and expand our personal bubble of life by becoming more flexible with the tasks that are needed to fulfill our vision. The Aquarian degree this New Moon falls in at 15° is about accessing the middle way. Again, we are working with the 15th degree of the constellation, which is opening the doors to the highest expression of the sign. Not too early, and not too late, there is a magical timing opening the gates to the highest form of this decan, which is about having faith in the new, moving on with maturity, and expanding our world. With the New Moon making an aspect to Chiron in Pisces, we are also offered an opportunity to heal some deep spiritual wounds that are blocking our ability to connect to God. If we have ever felt lost, alone and abandoned, then we can be found during this New Moon in Aquarius. Spiritual healing is as necessary as any other type of healing - it even superseeds mental, emotional and physical healing. Every TRUE healing is spiritual in nature, otherwise it is just compensation, i.e. we patchwork symptoms from one part of our being to another so we may portray ourselves as a seemingly functional and whole person. The New Moon of Aquarius is also traditionally a lucky New Moon as it shares the Chinese New Year. This year, we have even more luck as the Moon is making a harmonious aspect to the Point of Fortune in Libra. If we are able to put our judgements aside, we will be able to awaken generosity within our heart to share more with the world and those in need. It could be words, time, money, or energy that we are willing and able to share with others. Finally, something that we need to be extra aware of is that while the New Moon offers a lot of positive change, it all rests on our ability to close doors of temptation and karma. With conjunction to the Black Moon, we will be easily seduced into old ways and might relapse into negative ways. Let’s all do our best to be optimistic and - if necessary - make an extra effort to anticipate positivity within the new so that we can let go of our fear of change! My suggestion is to use your tools. There are actual tools like the Aquarius Essential Oil Blend, Skin Care Essential Oil Blend, as well as a Quartz Crystal to align with the proper consciousness to remain centered. We are also offering a New Moon Guided Meditation to help you set your intentions and align with the cosmic consciousness available. People who are unaware of the energies at play may be more susceptible than others who are aware. Share this article to help raise consciousness and bring awareness to what’s going on. We want to avoid relapsing into old patterns and patchworks as much as possible. So much energy goes into suppression and the creation of facades of happiness (e.g., Instagram) that we lose sight of what our truth is and what it could be. In order to have a goal, we first need to see where we stand, which means that sometimes we need to see and acknowledge what we don’t have. May you find authenticity and the radiating clarity of mind that comes with it in all that you do. If you’re serious about moving on with the wonderful New Moon in Aquarius, you can pre-order the guided meditation workshop. This New Moon will affect each of us specifically. Depending where this New Moon is occurring for you will tell you where to put your focus. 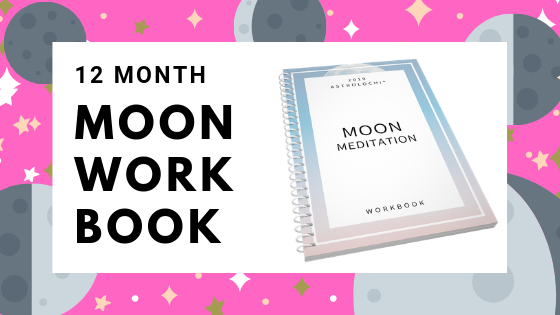 For easy insight, be sure to download my dash® Astrology Moon Meditation Workbook to optimize the energies and imagine the life you intend. Note for the next Full Moon of Aquarius February 19th, 2019. There are four realms in our physical world: The Animal Kingdom, The Mineral Kingdom, The Vegetable Kingdom, and the The Human Kingdom. Throughout the year, each kingdom is infused with new energy on its Astrological New Year. The next Full Moon, of Aquarius, is the the New Year for the Vegetable Kingdom. We all know that we would not be able to live without the Vegetable Kingdom, which includes trees, vegetables, fruits, flowers, and more. Once a year the entire Vegetable Kingdom receives a boost of renewing energy. We can contribute to this celebration by giving thanks to the Vegetable Kingdom and making an offering with any of our oils (which come from the Vegetable Kingdom). You may also meditate with and connect to the network of plants in a garden, in nature or in your home. The main goal is to achieve a state of appreciation for the environment. Be sure to eat your fruits, veggies and nuts to receive the energy at its highest! I hope you have found this complimentary forecast useful and insightful. If you want to give back, and support my work, it is happily and spirituality received here. Have a wonderful New Moon in Aquarius and I thank you for being the one who makes a difference by using dash® Astrology.